Majesty Crush vocalist David Stroughter has died. The heartbreaking news has been confirmed by several of his friends on social media, including ex-bandmate Hobey Echlin. [Update 2/6: Echlin wrote a wonderful piece on Stroughter which was published in the Metro Times today. Read it here]. Majesty Crush was one of the best bands of the 90s, yet they never attained the global fame and acclaim they very much deserved. In the early 90s the Detroit band played numerous shows at Saint Andrew's Hall and opened for notable headline bands such as the Verve and Mazzy Star. After the release of the magnificent Fan EP, they attracted the major label attention of Dali Records (Elektra subsidiary) which signed the band and went on to release their debut full length album Love 15 in 1993. In a cruel and tragic turn of events, Dali went under only months after the release of Love 15. 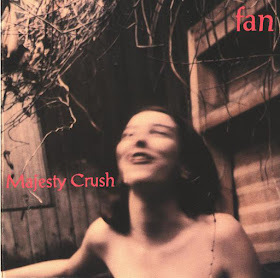 Majesty Crush went on to release another EP Sans Muscles independently, but called it a day in 1995. Stroughter eventually moved to Los Angeles, where he continued to make music. R.I.P. David Stroughter. Thank you for the incredible and glorious music.